All our professionals at Shoreline Oral & Maxillofacial Surgeons maintain the highest levels of accreditation and pursue ongoing education to stay abreast of the latest trends in oral surgery. 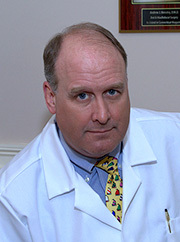 Dr. Andrew Kressley has practiced Oral & Maxillofacial Surgery in Old Saybrook, CT since 1993. He specializes in implant surgery, bone grafting, removal of wisdom teeth, extraction of teeth, treatment of oral diseases, temporomandibular joint disease (TMJ), corrective jaw surgery, and treatment of traumatic injuries to the teeth, jaws and face. As an oral surgeon, Dr. Kressley offers general anesthesia and intravenous sedation options for patients undergoing surgery in the office. Dr. Kressley graduated from Dickinson College and went on to graduate from the Temple University Dental School in 1988. He completed a General Practice Dental Residency at the Sacred Heart Hospital in Allentown, PA, then went on to receive his certificate in Oral & Maxillofacial Surgery from the Hospital of St. Raphael in New Haven, CT (now part of the Yale-New Haven Hospital network), serving as the Chief Resident in 1993. Dr. Kressley is a member of the Connecticut State Dental Association, the American Dental Association, past president of the Shoreline Dental Society, the Connecticut Society of Oral & Maxillofacial Surgeons, a fellow in the American Association of Oral & Maxillofacial Surgeons, and a diplomat of the American Board of Oral & Maxillofacial Surgeons. Dr. Kressley is on staff at the Yale-New Haven Hospital in New Haven, CT, and is a teaching instructor in the Oral & Maxillofacial Surgery residency program at that institution. He lives on the Connecticut shoreline with his wife and two teenage daughters and is a skier, catboat sailor and golfer. Dr. Kressley has been a volunteer firefighter for 39 years and is also a state fire instructor. Cindy is our office manager and handles scheduling, insurance information and billing practices. Cindy is also certified by the AAOMS as an Oral & Maxillofacial Surgery Anesthesia Assistant. Lynn is an Oral & Maxillofacial Surgery assistant and is a certified in Dental Radiation Health and Safety. 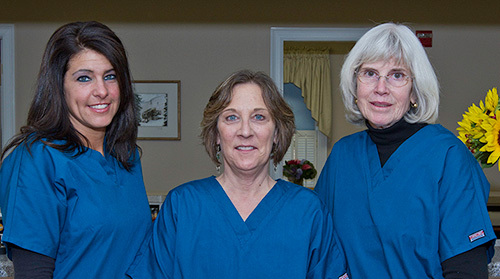 Pat is an Oral & Maxillofacial Surgery assistant and is also a certified Anesthesia Assistant by the AAOMS and certified in Dental Radiation Health and Safety. Pat is responsible for our OSHA compliance and Hazardous Material Safety compliance. All of the staff members are certified in BLS/CPR and AED usage.